To the east of the pyramid of Neferefre south of the pyramid of Queen Khentkaus II there are two pyramids known as Lepsius XXIV and XXV (or Lepsius 24 and 25). For some time these pyramids were largely ignored as they were thought by Borchardt to have been a double mastaba of an unknown noble. Further investigations by the Czech team under Verner confirmed that both structures were in fact pyramids and that Lepsius XXIV had a small complex including a cult pyramid and mortuary temple. The pyramids are both in rather a poor state having been quarried for stone in antiquity. The pyramid core was composed of three steps. The first step was composed of a retaining filled in with sand, gravel and rubble which was constructed by means of a ramp oriented north to south which ran through the core of the monument. The second step featured a retaining wall containing a series of diagonally aligned walls made of irregular shaped limestone again packed with rubble. The third stage (which may have taken place significantly later) involved the addition of fine limestone casing. The name of Ptahshepses (the Vizier of Niuserre of the fifth dynasty during the Old Kingdom of Ancient Egypt) was found among the builder’s marks on the masonry and so it is generally considered that the pyramid was built during the reign of Niuserre. The burial chamber was sunk into a deep trench on top of which the pyramid was constructed. An entrance in the north face led to the burial chamber which was oriented east to west. The mummy of a woman aged around twenty three was found along with fragments of a red granite sarcophagus. Fragments of canopic jars, alabaster vessels and the copper tools used in the opening of the mouth ceremony were found in the rubble. It is suggested by some that this burial took place some time later as the mummy has been excerebrated (the brain has been removed via the nasal septum) a process which was practiced from the Middle Kingdom. Despite this, it is still considered likely by Verner that she was the wife of Neferefre based on other evidence from the mortuary temple attached to the pyramid. Others have suggested that the pyramid may have been the burial site of Reputneb, the wife of Niuserre. The mortuary temple was built on the wall of the first step of the pyramid wall. It is also in a very poor condition and it is impossible to even confirm the layout with any certainty. It is thought that a false door was placed against the wall facing the pyramid. No fragments of reliefs have been recovered from the site so it is likely that the walls were not decorated. There is a small cult pyramid in the southeast corner of the complex. Unfortunately only a few pieces of the casing remain as much of the masonry has been removed by stone thieves. The bases seems to have been around ten square meters and the orientation of the cult pyramid does not quite match that of the main pyramid. Lepsius XXV is also considered to have been the pyramid of a Queen from the fifth dynasty, possibly another wife of Niuserre or Neferefre. 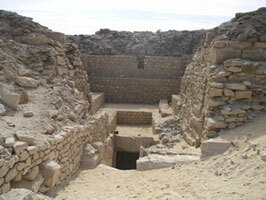 Lepsius XXV is actually composed of two adjacent tombs which resembled a mastaba. The eastern tomb was around twenty eight meters by twenty two meters and it was composed of white limestone. The burial chamber is accessed from an opening in the north face of the monument. A descending passage led from the north face to a burial chamber. There was a niche for a sarcophagus in the western wall and evidence of a burial including fragments of limestone canopic jars, fragments of alabaster vases, fragments of pottery and some of the copper tools used in the opening of the mouth ceremony. The smaller western pyramid was around twenty one meters by seventeen meters. It was composed of rough cut grey limestone. It is thought that it was built after Lepsius XXIV and the limestone cladding was never completed. Except for a few layers of the grey limestone retaining wall, most of the superstructure of this tomb had been removed by stone thieves. The upper parts of the descending passageway can still be seen and the foundations of the burial chamber are intact but other than that the pyramid is in a fairly ruined state. The sarcophagus was placed in a niche in the western wall of this chamber and there was evidence of a burial. Fragments of canopic jars and grave goods were found in the rubble along with pieces from the mummy of a woman. There was no mortuary temple attached to this double tomb. There was a small offering chapel on the eastern side of the eastern tomb. It was cased in fine limestone but does not seem to have been decorated. Part of the roof was found and it is thought that the chapel was around five meters high and had a small entrance hallway with a wooden door. In the southern end of the chapel a number of pieces of papyrus listing offerings were found and fragments of an alabaster statue of an unnamed woman. Workers inscriptions found in both tombs mention the pyramid complex of Userkaf and name the complex as The two (pyramids) are vigilant It is assumed it was also built by Niuserre due to its proximity to Lepsius XXIV and to the mastabas ascribed to the family of Neferefre.